The average rate on consumer credit cards jumped almost a half-point between August and September, breaking the 15% barrier and hitting its highest level since September of 2007, exactly two years ago. The current average rate now stands at 15.39%, up from 14.99% last month. A number of major credit card issuers raised rates in the last month, with the most significant development being the elimination of many lower-rate tiers normally reserved for those with good credit histories. Major issuers are showing that in the current financial environment they simply don't trust anybody. We note the particular significance of today's average rate equaling that of September 2007 -- a time when the Federal Reserve began taking steps to spur the economy by slashing interest rates. In September of 2007 the Federal funds rate was 4.75% and the Federal Reserve Board made its first in a series of interest rate cuts that eventually took that rate down to essentially 0%. However, while these cuts initially brought down credit card rates, subsequent events -- including rising defaults and the recently passed Credit CARD Act -- have spurred issuers to bring rates right back up. Credit card rates have come full circle in the last two years, despite the Federal Reserve cutting interest rates by almost 5%. The average credit card rate for non-reward consumer credit cards jumped to 14.27% this month, up from 14.07% in August, while the average rate for credit cards offering rewards increased to 15.87%, up significantly from the 15.39% rate of a month ago. 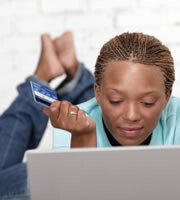 While the averages listed above attempt to take into account the multiple tiers that many credit card issuers offer, IndexCreditCards.com also tracks the very lowest listed rates, those reserved for customers with the very best credit. As noted, these lower-rate tiers are under attack right now, and the jump in these averages shows it. For the market as a whole, customers with excellent credit are now seeing an average rate of 11.86%, up a full half-point since last month, when this rate was 11.36%. Breaking this average down, the average rate that excellent-credit customers can expect on non-reward cards jumped to 10.94% from 10.13% last month, and increased to 12.25% on reward credit cards, up from 11.89% last month. Business credit card rates also jumped. The average rate for non-reward business credit cards increased to 13.37%, up from 13.19%, while the average rate for business credit cards with rewards increased to 13.83%, from the previous average of 13.71%. Strangely enough, there was once again no change in the rates being offered to students -- the average student credit card rate remains at 15.33%, where it has been all summer. Note that this rate is now lower than the average rate for mainstream credit cards. It is hard to say whether we should interpret this to mean that students are now seen as lower risk than older adults, or whether rates are simply being ignored because so few cards are actually being issued to students. 0 Responses to "Credit Card Interest Rates Monitor - Archive of Credit Card Rate Updates"